AstraZeneca (AZ) is a biopharmaceutical company formed in 1999 following the merger two existing European international pharmaceutical companies: Astra AB, a Swedish company founded in 1913, and Zeneca Group PLC, a British company founded in 1993 (as a subsidiary of Imperial Chemical Industries, a British company founded in 1926) . 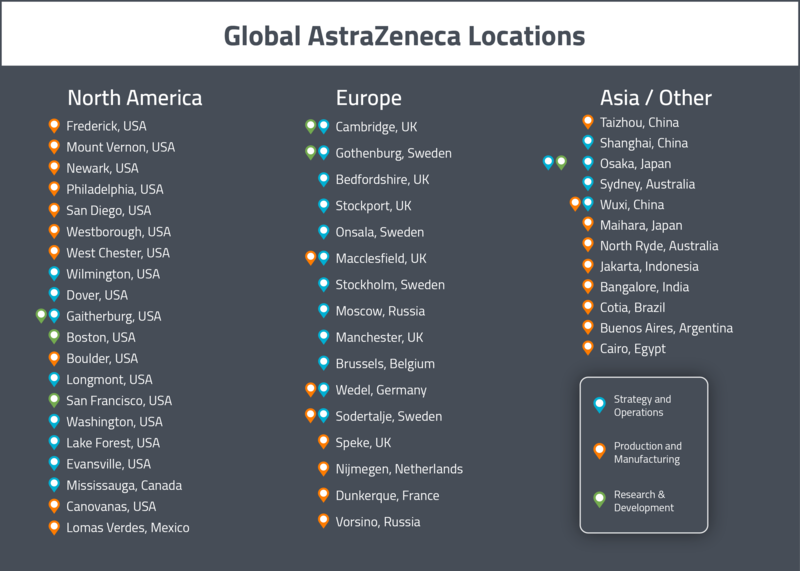 Since 2013, AstraZeneca has been headquartered in Cambridge, UK. AZ is among the biggest international pharmaceutical companies. In 2018, they ranked 11th on the global list of highest earning pharmaceutical companies . The company made many corporate acquisitions since its inception, with recent examples including Cambridge Antibody Technology (in 2006 for $567M), Ardea Biosciences (in 2012 for $781M), Pearl Therapeutics (in 2013 for $1.2B), ZS Pharma (in 2015 for $2.7B), Acerta Pharma (in 2015 for $5.7B) and Takeda’s respiratory business (in 2016 for $575M) . The following article will explore the current affairs and future orientation of this Anglo-Swedish multinational corporation. To accomplish this, we will give a business overview for AZ’s current operations, summarize their outsourcing history, map out their global drug development sites & decision makers, and highlight their current strategies for capturing innovation. At the end of 2017, AZ reported having 61,100 employees globally . The company’s main therapeutic areas (ranked in descending order of product sales for 2017) are: Cardiovascular & Metabolic Diseases ($7.3M), Respiratory ($4.7M) and Oncology ($4.0M). They also pull in $4.2M in sales from products in various other disease areas, outside of their 3 specialties. In 2017, AZ invested $5.8B into R&D and $13B into suppliers . Their pipeline currently has 143 projects in their pipeline, with 9 additional molecular entities in late-stage development . They have 543 active clinical trials. A table summarizing AZ’s main pharmaceutical products can be found below. Table 1 AstraZeneca's top drug products. 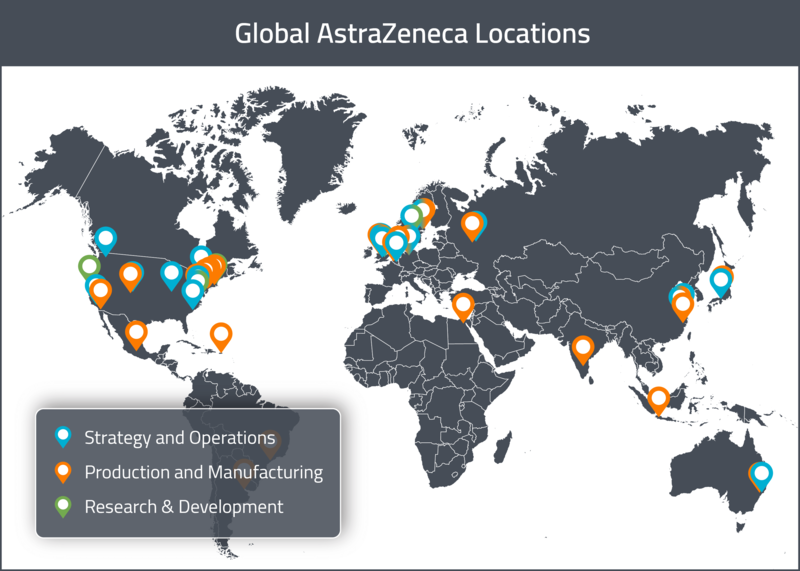 AstraZeneca employs a global strategy of "Partnering with best-in-class medical and scientific institutions and introducing greater flexibility into our operations" . This means they frequently enter into partnerships with third parties. They especially seem to favour partnerships with CROs. AZ has an extensive history of working with CROs in the clinical bioanalysis space, using several different outsourcing models. 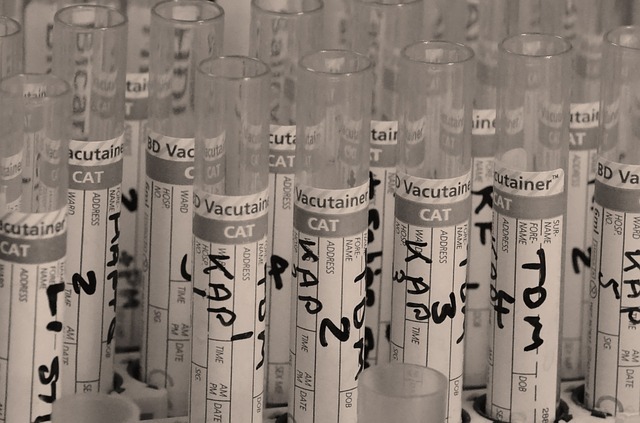 In 2011, they famously entered the first 5-year cycle of The AstraZeneca and Covance Laboratories Clinical Bioanalysis Alliance (CBioA) to fully centralize their outsourcing model to optimize and reduce costs in analytics . Another example from 2012 was their preferred-partner arrangement with Charles River Laboratories for regulated safety assessment and drug metabolism & pharmacokinetics testing . AZ also has a history of outsourcing manufacturing. Recently (in 2016), they sold off one of their manufacturing facilities in Avlon, England to Avara Pharmaceutical Services Inc., with the intention of outsourcing production of their products to Avara. More recently, in 2018, AZ entered into a long-term manufacturing agreement with Cambrex . Finally, AZ also has a history of outsourcing multiple services to providers in unfamiliar or emerging markets. For example, in 2012, they entered into partnership with WuXi AppTec to bring an inflammatory disease drug candidate to the Chinese market . Under this partnership, WuXi AppTec would be responsible for local regulatory, manufacturing, pre-clinical and clinical trial support. Similarly, in 2018, they partnered with Saudi Pharmaceutical Industries & Medical Appliances Corporation (SPIMACO) in the Kingdom of Saudi Arabia for an Investment, Development and Technology Transfer initiative of five AZ products . ‍Do you have a Zymewire account? Click here to view all of AZ's global activity! Despite all its outsourcing, AZ still has multiple, international R&D, manufacturing and operations sites. In this section, we will provide a map of AZ’s major sites across the globe. For a visual representation of these global sites, see the map below. As previously mentioned, AZ’s global and European headquarters are located in Cambridge, UK. AZ’s North American headquarters for Business & Strategy are located in Wilmington, Delaware. AZ’s North American R&D sites are located in Gaithersburg (Maryland), Boston (Massachusetts) and San Francisco (California). In Europe, there is an R&D site in Gothenburg (Sweden) and the R&D headquarters is based out of Cambridge, UK. In North America, there is a non-biologic drug substance manufacturing site Boulder (Colorado), in addition to the operations &manufacturing facilities in West Chester (Ohio), Newark (Delaware), Mount Vernon (Indiana) and Philadelphia (Pennsylvania). The principal biologic manufacturing sites in North America are located in Frederick (Maryland), Greater Philadelphia (Pennsylvania), Boulder (Colorado) and Longmont (Colorado). Longmont (Colorado) also includes a cold chain logistics support site. In Europe, there do not appear to be any non-biologic manufacturing sites, however there are biologic manufacturing sites are located in UK (Speke) and the Netherlands (Nijmegen). 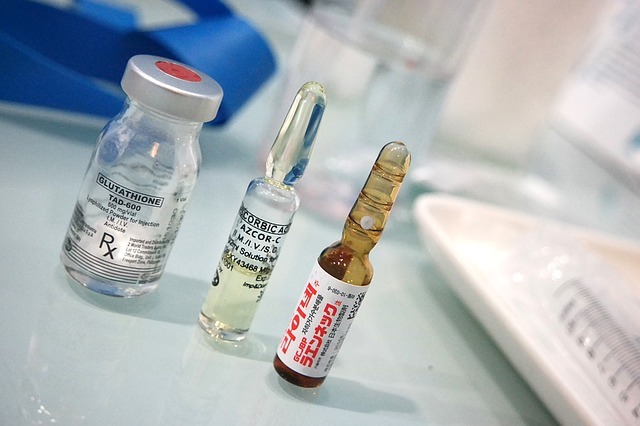 For APAC, there do not appear to be any specialized biologics manufacturing sites, however there are manufacturing facilities in China (in Taizhou and Wuxi). Decision making has been classified into three sections: clinical outsourcing, manufacturing and logistics. This is to facilitate outreach efforts by different types of companies looking to sell to or partner with AZ. The general trend encompassing all types of decision making at AZ is that the vast majority of North American decisions seem to be based out of the Greater Philadelphia area. Focal points for European decision making appear to be the UK and Sweden, in particular Cambridge, UK. This makes sense given that AZ is a Swedish-British founded company whose global headquarters are in Cambridge, UK. APAC decision making seems limited to a regional level with Osaka (Japan), Wuxi and Shanghai (China) and Sydney (Australia) housing most decision makers. For North America, clinical outsourcing decisions are based primarily out of the Greater Philadelphia area. Look for job titles such as Clinical Outsourcing Manager and Director Clinical Outsourcing based out of this area. There is also a Senior Clinical Outsourcing Manager in Dover (Delaware) and a Global Category Manager in Washington (DC). European clinical outsourcing decisions are spread out across the United Kingdom and Sweden. The Vice President of Alliance and Integration Management, the Global Category Leader of Clinical Trial Outsourcing and the Associate Director of Clinical Development are all located in Cambridge, UK. Also in the UK, we have an Director of Clinical Development in Bedfordshire, an Outsourcing Project Manager in Macclesfield and both an Outsourcing Associate Director and an Outsourcing Manager in Stockport. In Sweden, you’ll find an Outsourcing Manager, a Commercial Lead of Clinical Alliance and a Clinical Outsourcing Manager in Gothenburg. Also, in Sweden, you’ll find a Manager of Clinical Operations in Onsala. For Asia-Pacific, there is a Clinical Alliance Manager in Osaka (Japan) and a Senior Clinical Trial Support Manager in Shanghai (China). North American manufacturing decisions are also based primarily out of the Greater Philadelphia area. The Global Head of Manufacturing and the Global External Supplier Manager are based out of there. The Global Category Leader of External Manufacturing is based out of Gaithersburg (Maryland) and the Regional Director of Manufacturing is based out of Evansville (Indiana). In Europe, manufacturing decisions are more spread out, but there are some big players based out of Stockport UK. In Stockport, you’ll find the Vice President of Global External Sourcing (who works with more than 200 CMOs) and the Project Manager for Global External Sourcing. Also in the UK, you’ll find a Manufacturing Director in Macclesfield. In Sweden, you’ll find a Global External Sourcing Specialist in Sodertalje. In Russia, you’ll find a Contract Manufacturing Manager in Moscow. Finally, in Germany, you’ll find a Head of Production in Hamburg. For APAC, there is a Director of Supply and Manufacturing in Sydney (Australia). In China, there is a Vice President of Supply & Manufacturing in Wuxi and a Head of Supplier Management for APAC and Latin America in Shanghai. Where are their global logistics operations based out of? Unlike for outsourcing and manufacturing decision making, logistics decisions seem to be split across North America. What’s more, logistics decision makers for North America are based not only in the United States, but also in Canada. There is a Senior Manager of Logistics and a Director of Supply Chain based out of Mississauga (Ontario) in Canada. 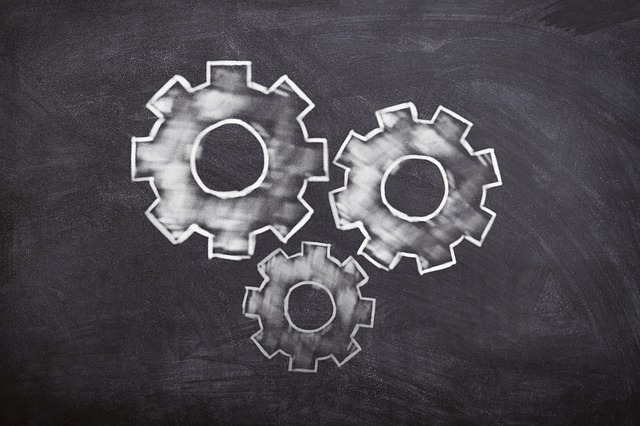 The Greater Philadelphia area still plays a big role in logistics decision making, with a Global Category Manager for Procurement, a Head of Procurement for North America and a Director of Global Logistics based out of there. In Washington (DC), there is a Global Category Manager, a Senior Logistics Manager and a Senior Supplier Relationship Manager. There is also a Director of Global Biologics Supply in Lake Forest (Illinois), a Sourcing Manager in the Greater Boston area, a Biologics External Supply Director in Gaithersburg (Maryland) and a Global External Sourcing Supply Planner in Dover (Delaware). In Europe, there are many logistics decision makers based out of UK, especially in Macclesfield. In Macclesfield, there is a Global Category Manager, a Lead Global Category Manager, a Global Head of Logistics, a Supplier Director for Global External Sourcing, a Site Procurement Manager and a Head of Procurement. Also in the UK, there are multiple Global Category Managers in Cambridge and there is a Head of Procurement for Europe in Greater London. In Sweden, there is a Global Category Manager in Gothenburg and a Director of Supply Chain Projects in Stockholm. 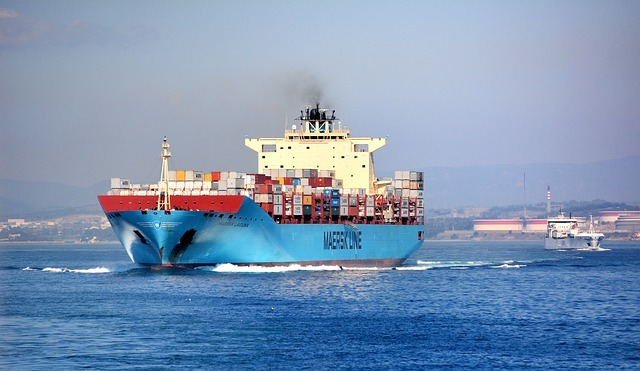 There is a Senior Manager of Procurement and Logistics in Moscow (Russia), a Logistics Manager in Brussels (Belgium) and a Head of EMEA Logistics in Hamburg (Germany). For APAC, the only decision maker appears to be the Head of Distribution for APAC, who is based in Sydney, Australia. Do you have a Zymewire account? Click here to view all of AZ's global activity! To foster innovation, AstraZeneca has transformed some of its R&D sites into BioHubs, which are open research spaces meant to be shared between multiple life sciences start-up companies . These sites are meant to be dynamic centers promoting drug discovery. A wide variety of companies and scientists are meant to come together to share ideas and collaborate on projects. The first BioHub opened in Waltham, Massachusetts in 2015. Two more BioHubs have launched in Molndal (Sweden) and Alderley Park (UK). Another way AZ fosters innovation is through their R&D model. Their science starts with their Innovative Medicines and Early Development (IMED) unit, which posts many competitions and funding opportunities the global science community . For instance, AZ partner with InnoCentive to crowd-source solutions to our R&D challenges; They openly share challenges and look to collaborate with researchers and companies willing to propose innovative solutions. In an effort to foster innovation out of Europe, AZ has also established a center called the BioVentureHub at their R&D site in Gothenburg, Sweden . This site is meant to provide budding biotech companies and academic groups with a research space wherein they can have facilities to operate and opportunities to collaborate with big pharma and other start-ups to advance the life sciences. If you would like a simple solution for keeping an eye on drug sponsor companies, like AstraZeneca, without relying on a database and generic lists of leads each week, we at Zymewire are here to help. Reach out today, and stay tuned for the next instalment of Sponsor Atlas: Selling to the Pharma Giants. If you enjoy these articles, please feel free to give them a share through the social links below! To view Part 3 of the Sponsor Atlas series, Navigating Bristol, Myers, AND Squibb: A Map For Selling To Bristol-Myers Squibb, click here!